A rolling beat ebbs from the speakers around you and a cheer explodes from your table, confirming the food has arrived! The gruff cook approaches with a metal tray stacked with sausage, lamb, steak, and ribs dripping in marinade, and you twist the top off your second Savannah (a sharp, dry cider native to South Africa) and lift it up to a toast with your mates: “To Mzoli’s!” After a cheer and a long swig, you check the time: it’s barely past 11 a.m. on Sunday, and there are still many more hours of debauchery to be had. Mzoli’s, a local favorite joint for a braai, offers traditional South African gastronomy with modern South African spirit. An Afrikaans word, “braai” translates simply to “barbecue,” but to Capetonians a braai offers much more than merely eating together. Locals head to Mzoli’s on their weekend mornings to let loose with friends, to dance together, and to congregate over juicy meats prepared in the South African fashion. The raucous spirit of these traditional Sunday morning celebrations is tangible; you will find all of the energy of a Super Bowl party with the joy of your best friend’s wedding. 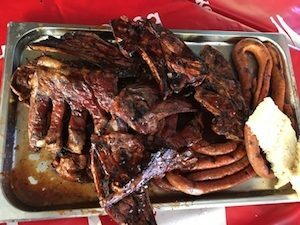 An insider tip: Mzoli’s provides only the meat and the party, but allows guests to bring any other food or drink in with them. While the kitchen spices, marinates, and cooks your meats of choice, step into any of the nearby stores to pick up additional accouterments like cups, silverware, and enough Savannah for all. Mzoli’s is located in Gugulethu, a township just 15 minutes from central Cape Town: Ny 115, Gugulethu, Cape Town, 7751. +27 21 638 1355.